Chef Paul Stearman is a contradiction. The Washington D.C chef has an impressive, classic pedigree including training at L’Academie de Cuisine and cooking under Chefs Jeffrey Buben and Robert Wiedmaier. He has a storied career that included stints at Vidalia, the Watergate, and Kinkeads. 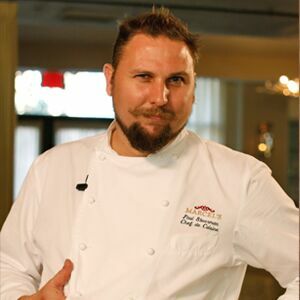 Yet as Chef de Cuisine at Marcel’s, Paul remains humbly committed to training up-and-coming young chefs and instills in his protégées a disdain for waste and a love of classic French cuisine. His enthusiasm for the sensual side of cooking- the smells, the sounds, the feel of the food- translates to dishes that are multifaceted and complexly flavored. “Hands on” doesn’t begin to describe the chef: in addition to preparing the delicious fare at Marcel’s and acting as its pastry chef, Paul also can be found making repairs to the restaurant when needed. He enjoys hunting and cooking with wild game and touts the respect the hunter-chef must show by using the entire animal. Paul devotes much of his spare time to charitable works, but still finds time to engage in a variety of sports. This easy-to-make purée has the tangy flavor of celery and is a creamy, flavorful alternative to mashed potatoes. Popular in French and Belgian cooking, the fresh and sharp-flavored celery root can be puréed, roasted like a potato, or shaved into a slaw.